The April 2019 meeting will be Thursday, April 18th at the Elks, 1900 (7:00 PM). Yes, this is an earlier start time as we have additional ceremonies to accomplish. If you have anything to bring up let us know ahead of time, so things move faster. Click here for more information about the meeting location. This entry was posted in Meetings and tagged Buddy Poppies, Cranberry Twp Events on April 16, 2019 by VFW Post 879. The March 2016 meeting will be Thursday March 17th at the Elks, 1900 (7:00 PM). If you have anything to bring up let us know ahead of time, so things move faster. Click here for more information about the meeting location. This entry was posted in Meetings and tagged Buddy Poppies, Cranberry Twp Events, Meeting Reminder on March 17, 2016 by VFW Post 879. 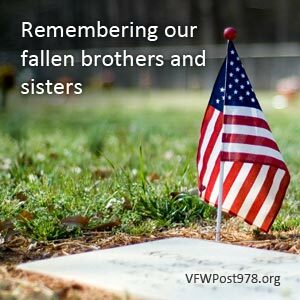 The video of VFW Post 879’s Memorial Day Ceremony from 2013 has been posted to YouTube. Please share it with friends and family as we remember those service members that have gone before us. Thank you to all of the men and women that volunteered their time and efforts to make this a success. A special thank you to Phil Stebler, VFW Post 879 Chaplain, for his efforts in organizing this event. This entry was posted in News and tagged Annual Memorial Day Ceremony, Cranberry Twp Events, Videos on September 25, 2013 by VFW Post 879. Attention Post Color Guard Members. We have been asked to present the Colors at new playground dedication ceremony in Cranberry Township on 26 September, 2013. Please keep this date open, and we will go over the details at the August meeting. This entry was posted in News and tagged Color Guard Requests, Cranberry Twp Events on August 10, 2013 by VFW Post 879. The May 2013 VFW Post 879 meeting will be on 16 May at 7:30 PM At the Elks Lower level. Click here for more information about the meeting location. This entry was posted in Meetings and tagged Annual Memorial Day Ceremony, Buddy Poppies, Cranberry Twp Events, Meeting Reminder on May 7, 2013 by VFW Post 879.